As one of the managers of Signatures Salon, one of my roles is the salon's photography. This is one of my passions and favorite avenues of my job. With that in mind, I was asked by the White family to photograph a party to honor Wendy's parent's 46th wedding anniversary. It was such an honor to be asked, and if you know the Whites, you know this would not just be any regular ol' party. They hosted what is called a 'Pop-up Party" in their backyard. A Pop-up Party is a one of a kind event featuring a unique setting and menu. It's an on-location event, from start to finish. The food was prepped, cooked, and served all in their backyard. This gathering was a perfect fit for the Whites. 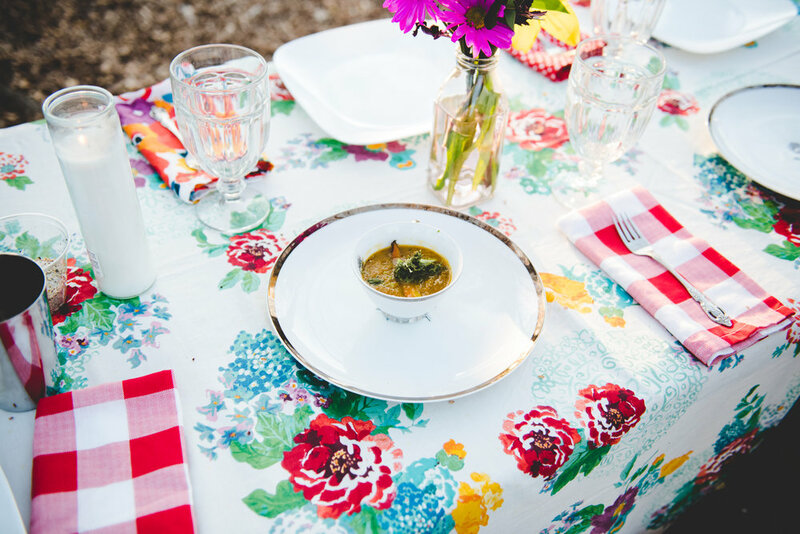 Tablecloth-clad tables adorned with yard picked-flowers, original wedding dishes, and a one-of-a-kind menu hand-created for them is just a taste of what this party embodied. The creative menu was brought to them by the dynamic duo creatively named Scratch Kitchen. 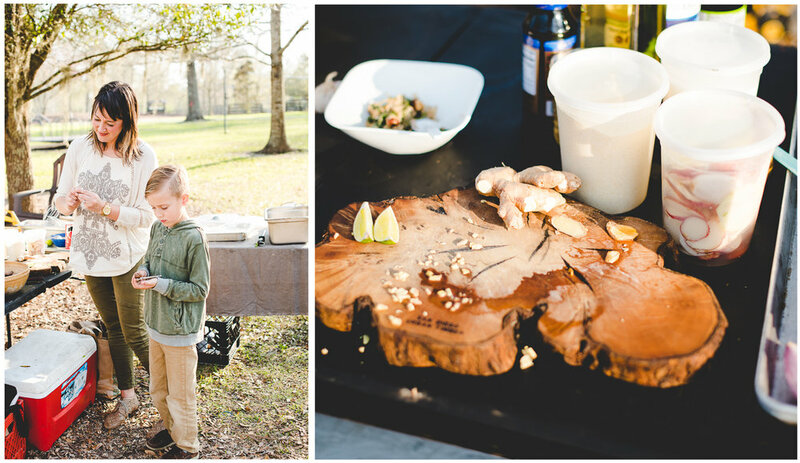 Kelsie and Jaime are from Lafayette, Louisiana and their farm-to-table food pairings are nothing short of a work of art. The menu included roasted cattails (yes you read that right, straight from the edge of a Louisiana pond), reishi mushroom stock carrot soup topped with pesto, a charcuterie board, red lentil pate' and lamb pate', and a dessert made of pecan crust beet cobbler topped with elderberry chia seed which was absolutely heavenly! The work station was on-sight and the detail and craftsmanship put into creating this food was a sight to see! So you might be thinking...yes it sounds neat, but how did it taste?!? Let me just tell you, it was all so delicious. The flavor was rich, bold, and literally freshly picked. It was visually and aromatically stimulating. These ladies set up shop weekly at the Lafayette farmers market, so if you find yourself in that area, do yourself a favor by partaking in their unique gifting. It is worth your while! The next time you find yourself hosting an event, think outside of the box and consider a Pop-up party! It can be tailored to your specific style and taste, but its unique qualities and memorability factor are unmatched. And, if you are interested in a farm-fresh unique menu, Scratch Kitchen is definitely the way to go! Enjoy and be inspired. Eat, drink and be uniquely merry.